This week, the ‘#10YearsChallenge’ took over the internet with social media users and celebrities, including Ellen DeGeneres, Brie Larson, Steve Aoki and more, joining in to share side-by-side images of themselves dated a decade apart. The humorous entries have inspired online platform 9GAG to take things one step further with celebrities versus their art doppelgängers in a modified ‘#ManyManyYearsChallenge’. 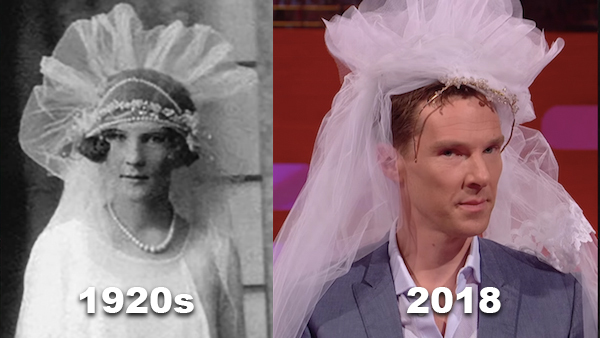 For instance, Benedict Cumberbatch revisits the 1920s portrait of his lookalike as a bride, first introduced to the actor on BBC One’s The Graham Norton Show in 2018. Other comparisons involve Game of Thrones actor Peter Dinklage, who plays character ‘Tyrion Lannister’ in the HBO hit series that will return on 14 April 2019, Facebook CEO Mark Zuckerberg, actor Tom Hiddleston, and more. See all the humorous side-by-sides inside 9GAG’s witty Instagram album below. While fun, here’s why the viral ‘#10YearChallenge’ might not be as harmless a meme as you think.